The fall season is a time for layers: jackets, sweaters, scarves, and hats. Whether you live in a snowy wonderland or on the coast with chilly winds, we all get into experimenting with layers this time of year. But if you’re like me, you’ve never been totally sure how to throw on your favorite scarf, and layer with your favorite jewelry. Can you even layer a necklace with a scarf? Does the necklace go over or under the scarf? Will earrings work with a scarf or will everything just get tangled up? We’ve all had these questions about winter fashion. So I took a look at layering and pairing jewelry with scarves, and found that there are so many fun ways to make this style work! There was no one way that worked better than another, and we had so much fun playing around with all these new styles of layering. We took a pretty aquamarine scarf, layered with a flowy sweater, and then through a simple long-chain necklace over the top. Paired with a matching turquoise and gold bracelet and ring, and the look was perfect! Here, the necklace could have been worn under or over the scarf, but I loved how the gold chain looked over the aquamarine silk. So pretty, and so simple, and this style was also so comfortable! 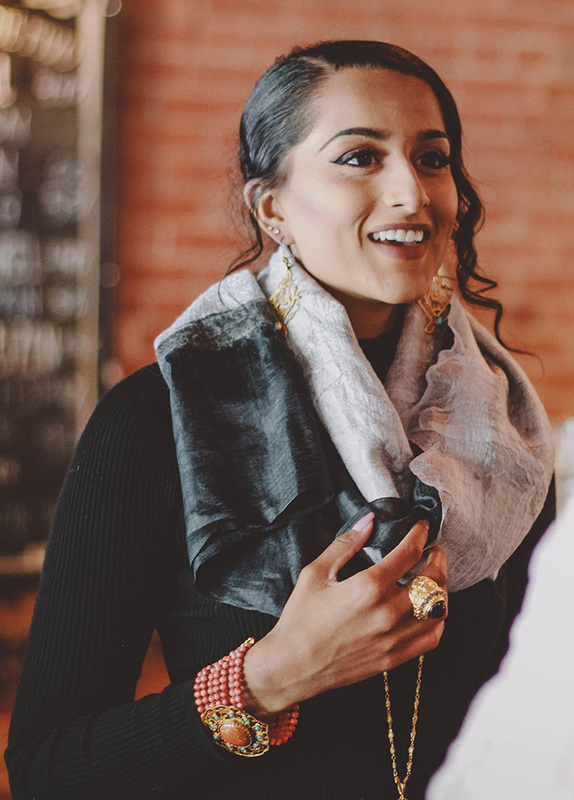 For this look, we decided to focus on big statement earrings, and making them work with a thick scarf. Sticking with the classic over-the-shoulder scarf style, we through on some big gold earrings and the result was stunning. 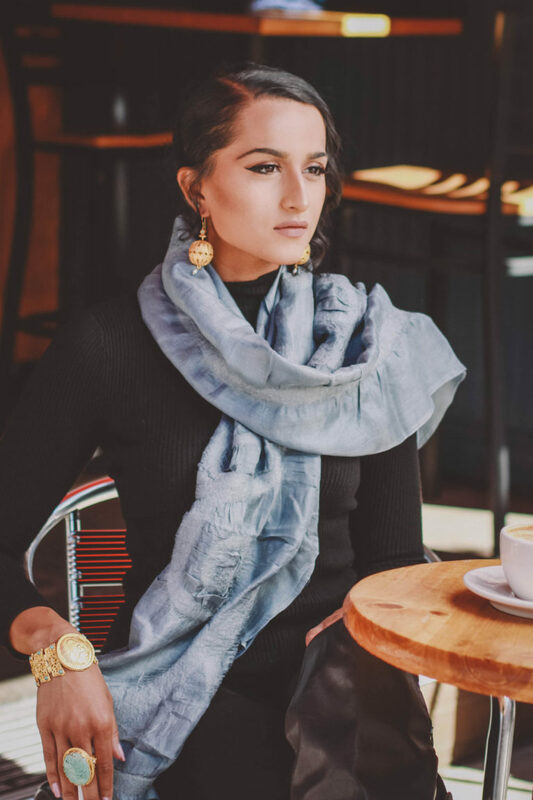 The earrings stand out beautifully against the dark gray of the scarf. Together, the two bring so much texture to this look. For this sweet pink look, we draped the scarf over the shoulders to create a unique look, quite like a shawl. 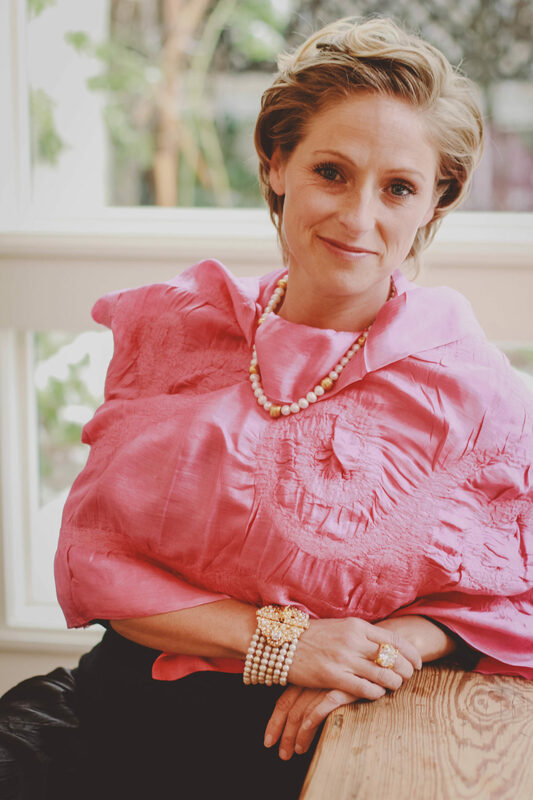 Adding a delicate strand of freshwater pearls makes this look elegant, and perfect for a fancy night out. Our favorite pearl and cubic Zirconia bracelet and ring add even more sparkle to the style, and we can’t get enough of it! This look is truly perfect for fall. 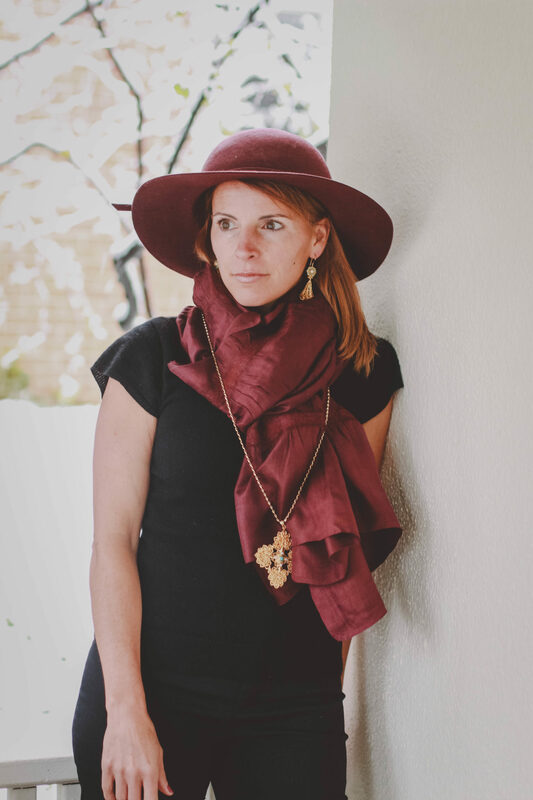 The deep red color of our Marsala scarf captures the fall essence and is flattering on any skin tone, with any outfit. Layered with a beautifully detailed cross necklace, and these layers truly pop out. Perfect for a casual fall outing in jeans and a t-shirt, or even with a dress to add some seasonal flair to a nicer look! And finally: the statement necklace. This was the one we were most curious about… can you layer a statement necklace over a scarf? Well yes, you can. And it looks really fantastic. Here we wrapped the scarf around the neck twice and threw on a leather jacket to keep it in place. 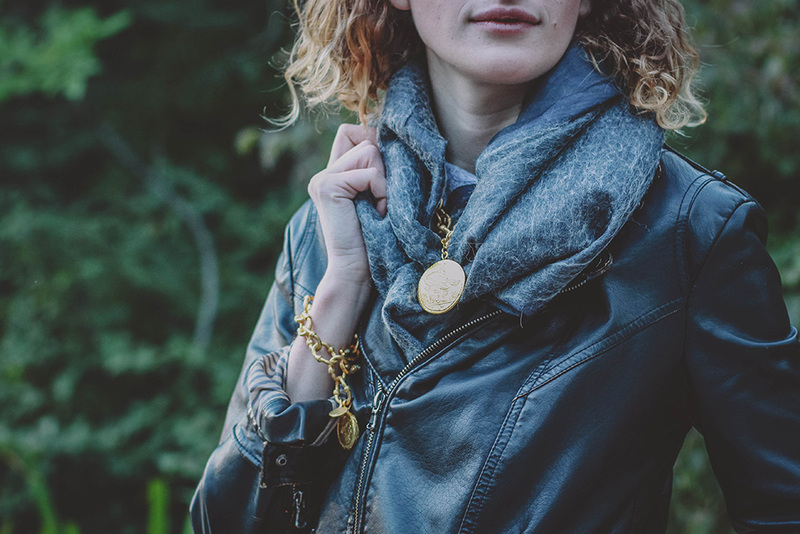 The statement necklace, which has a thick chain and eye-catching gold coin, sits right on top of the thickest part of the scarf. 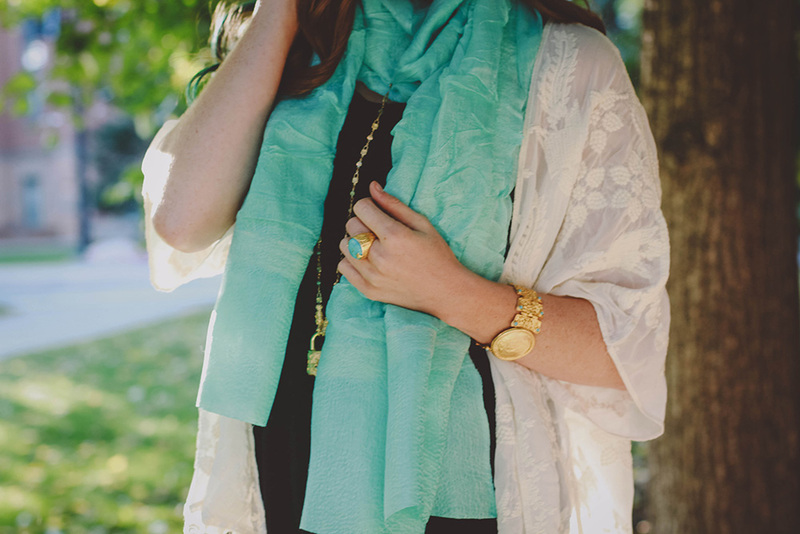 The color contrast is amazing, and the gold coin blooming out of the layers of scarf is absolutely stunning! So the next time you’re deciding between wearing jewelry or staying warm, remember that you can totally do both. Play around with layering your jewelry over your scarf, because there are absolutely no rules when it comes to your unique style.